On January 3, 1994, the Audio-Animatronic show Kitchen Kabaret, located in Epcot’s The Land pavilion, closed, having run for a little over 11 years. The show presented nutrition through the use of Audio-Animatronic food groups, led by Bonnie Appetit, singing songs such as “Veggie Veggie Fruit Fruit” and “Boogie Woogie Bakery Boy.” For most of the show’s run, it had a sponsorship by Kraft; company sponsorships were fairly commonplace within many Epcot attractions. The show was replaced by Food Rocks, which opened on March 26, 1994. Posted in Uncategorized and tagged 1990s, Audio-Animatronic, Closed, Disney Park, Epcot, Walt Disney World. Bookmark the permalink. On February 27, 2007, the audio-animatronic attraction Muppet Mobile Lab had its first test in front of the public at Disney’s California Adventure. 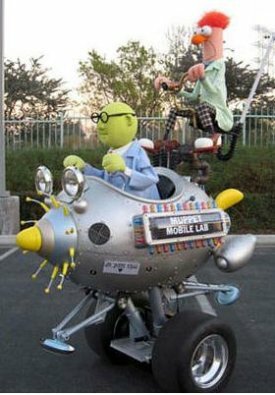 Similar to Push the Talking Trash Can, the audio-animatronic “mobile lab” featuring Muppet characters Dr. Bunsen Honeydew and Beaker travel around the park, interacting with guests with the use of special features. 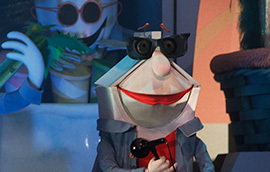 Muppet performer Dave Goelz, who created the character of Bunsen, was brought to Glendale to assist with the project, making sure that the Imagineers portrayed the characters correctly. The figure was also tested in Walt Disney World and Hong Kong Disneyland. Posted in Uncategorized and tagged 2000s, Audio-Animatronic, Disney Park, Disney's California Adventure, Muppets. Bookmark the permalink. On July 18, 1965, the Audio-Animatronic attraction Great Moments with Mr. Lincoln opened in Disneyland’s Main Street area. The attraction was created for the New York World’s Fair, presented at the State of Illinois pavilion. Lincoln was a hero of Walt Disney’s when he was a boy, and was the perfect pick for a presidential tribute at the time. After the World’s Fair, the popularity of this and the other Disney-created attractions made way for these attractions to be placed within Disneyland. Great Moments with Mr. Lincoln was closed in 1973 to be replaced with The Walt Disney Story, but the popularity of the attraction demanded its return; it was brought back as The Walt Disney Story Featuring Great Moments with Mr. Lincoln in 1975. The original voice of the attraction was actor Royal Dano, who had performed as Lincoln in several films due to his uncanny resemblance. In 2001, the attraction underwent a major restoration effort, with the voice actor changing to Warren Burton, and a few changes made to the story. Posted in Uncategorized and tagged 1960s, Attraction, Audio-Animatronic, Disney Park, Popularity. Bookmark the permalink. 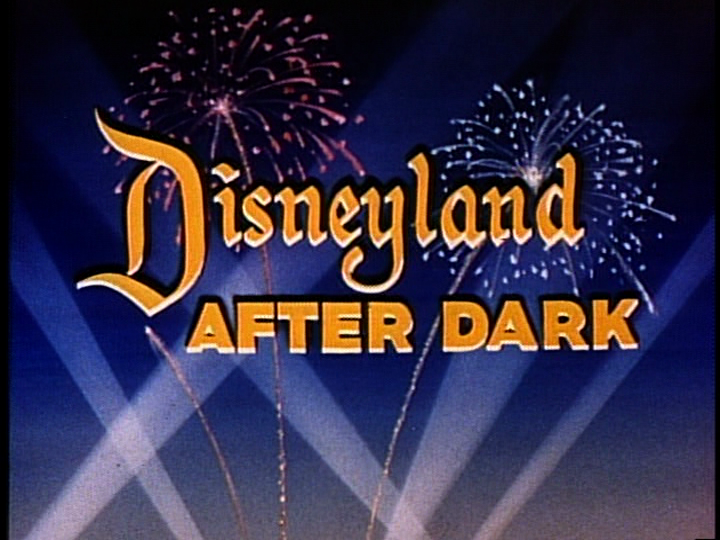 On April 15, 1962, the episode of Disneyland anthology series entitled “Disneyland After Dark” premiered on NBC. 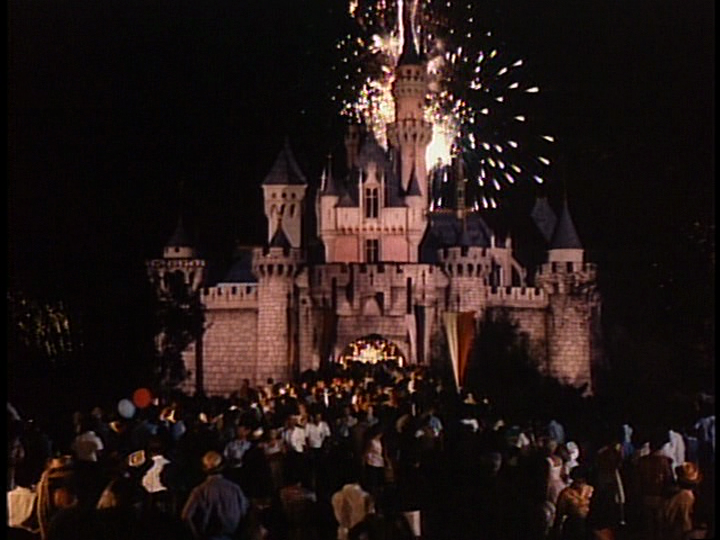 The show hadn’t been set in Disneyland for a few years at this point, and to generate interest, Walt and his creative team tried to show viewers what the park was like at nighttime, bringing a few special guests along the way. The episode was popular enough that it was shown as a short subject in theaters overseas. Guest stars include the Osmond Brothers (in their first television appearance), teen idol Bobby Rydell, Mouseketeers Bobby Burgess and Annette Funicello, and jazz legends Louis Armstrong, Kid Ory, and Johnny St. Cyr. The episode was written by Larry Clemmons, and was directed by Hamilton S. Luske and William Beaudine. It’s the end of the day at Disneyland, and the monorail heads back to the Disneyland Hotel, where guests are invited to experience Disneyland, after dark. The guests step out at Tomorrowland station, where Walt is waiting at the Magic Kingdom. He explains how sundown is his favorite time of day at the park, as a new type of magic takes over once it gets dark. He explains a few of the events that will be shown that night, when a girl comes by and asks him for an autograph. He obliges, and a few other people come by for his autograph, until he’s bombarded. He tells the audience to head off without him, and he’ll catch up later. The sky darkens, and the park comes alive with lights and excitement. The Dapper Dans sing on Main Street, surrounded by guests. After the Dapper Dans, the audience meets with Walt again, who introduces Annette, Bobby Burgess, and Bobby Rydell, who are in Tomorrowland, dancing, with Annette and Rydell announced to sing for the audience. Everyone is asked to turn towards Sleeping Beauty’s Castle, where a fireworks show is being performed with several characters showing up, including the Three Little Pigs, Alice and the Mad Hatter, and of course, Mickey and Minnie. Tinkerbell starts flying over the park from the Matterhorn, and sets off the celebration. Walt is then seen again, still surrounded by autograph seekers, and he points out a Tahitian floor show being performed with several energetic Tahitian dancers, including a fire knife dancer. They then have a performer do the Tahitian Fire Walk, an important ritual that surprises many an audience member. Afterwards, Walt is seen again, surrounded by autograph hounds, and he introduces the jazz performers on the Mark Twain. The original girl that started off the chain of autograph seekers (and who stole Walt’s popcorn) returns, bringing him back his popcorn. He promises to catch up with the audience later, as two children stop to ask him to sign their maps. The Mark Twain Riverboat stops by, with jazz music playing merrily from inside. She sails down the river, with guests and enjoying the entertainment, while the waiters dance. Louis Armstrong then sings a song for the crowd, before being given his horn to play. Armstrong reminisces with Kid Ory and Johnny St. Cyr before launching into another tune, much to the audience’s delight. Meanwhile, Walt is still signing, this time at the Plaza Gardens, where the place is “jumping” as he puts it. The main girl comes back with several hats for him to sign, but brings him a hat just for him to wear as thanks. At the Plaza Gardens, the Osmond Brothers are brought to the stage to sing for the audience. After their performance, the audience gets up to dance once again. After dancing, they bring out vocalist Tony Perez and they have the audience sing along with him. Walt greets the audience one last time, wishing them goodnight before leaving to get ready for the morning – his other favorite time of day at Disneyland. Posted in Uncategorized and tagged 1960s, Audio-Animatronic, Color, Disney Park, Television, Walt Disney, Wonderful World of Color. Bookmark the permalink. On March 26, 1994, the audio-animatronic show Food Rocks opened in The Land pavilion in Walt Disney World’s Epcot. It was sponsored by Nestlé foods. It replaced the former show Kitchen Kabaret, and like its predecessor, taught guests about the importance of proper nutrition. The show featured several songs which were parodies of songs from popular culture, including Aretha Franklin’s “Respect” (becoming “Just a Little Bit” by the Get-the-Point Sisters) and Peter Gabriel’s “Sledgehammer” (becoming “High Fiber” by Pita Gabriel). The show was presented as a benefit concert, which was constantly interrupted by the junk food heavy metal band The Excess. The show became a cult favorite among guests, but eventually was closed on January 3, 2004 to be replaced by the popular attraction Soarin’. Posted in Uncategorized and tagged 1990s, Attraction, Audio-Animatronic, Disney Park, Epcot. Bookmark the permalink. On December 9, 1994, the fast-food restaurant Cosmic Ray’s Starlight Café opened in Tomorrowland of Walt Disney World’s Magic Kingdom. It replaced the Tomorrowland Terrace, which closed in September 1994. This quick service restaurant gives guests three “bays” to choose from in picking their meal: Bay 1 is chicken and BBQ pork sandwiches, Bay 2 is burgers and hot dogs (including a vegetarian burger), and Bay 3 is sandwiches, soups, and salads. 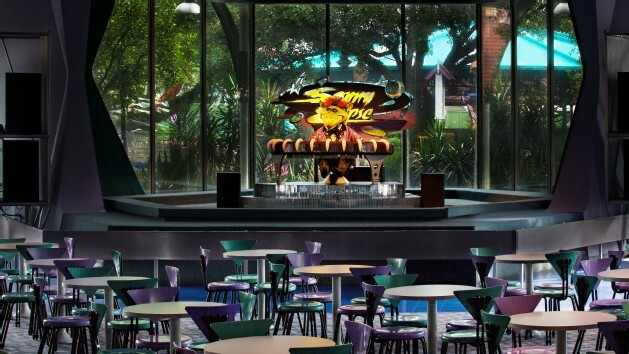 Guests can choose to eat either indoors or outdoors; the restaurant also features an Audio-Animatronic alien entertainer named Sonny Eclipse. Posted in Uncategorized and tagged 1990s, Audio-Animatronic, Disney Park, restaurant. Bookmark the permalink.